A record of my life in general including my hobbies of sailing, golf, photography, writng, ebooks, bamboo flute and blogs, also about my sail boats, yachts and the cars that I have owned. I write about the real reason why I left Malaysia and migrated to live permanently now in New Zealand. Also about my job with Sarawak Shell Lutong, the drilling industry, oil wells, rigs and how to drill an oil well. Picking mushrooms in NZ, deboning chicken at Inghams and other experiences. golf articles. 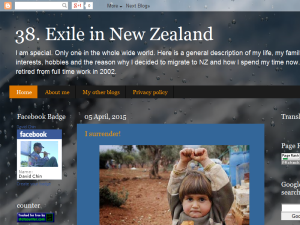 This what your Exile in New Zealand Blog Ad will look like to visitors! Of course you will want to use keywords and ad targeting to get the most out of your ad campaign! So purchase an ad space today before there all gone! If you are the owner of Exile in New Zealand, or someone who enjoys this blog why not upgrade it to a Featured Listing or Permanent Listing?